When I mentioned to my friends we were replacing the doors in our master ensuite area with barn doors I got a lot of blank stares. These people have seen our bedroom and I’m sure they were wondering how barn doors fit in with our decor. That’s why we built our own modern barn doors. 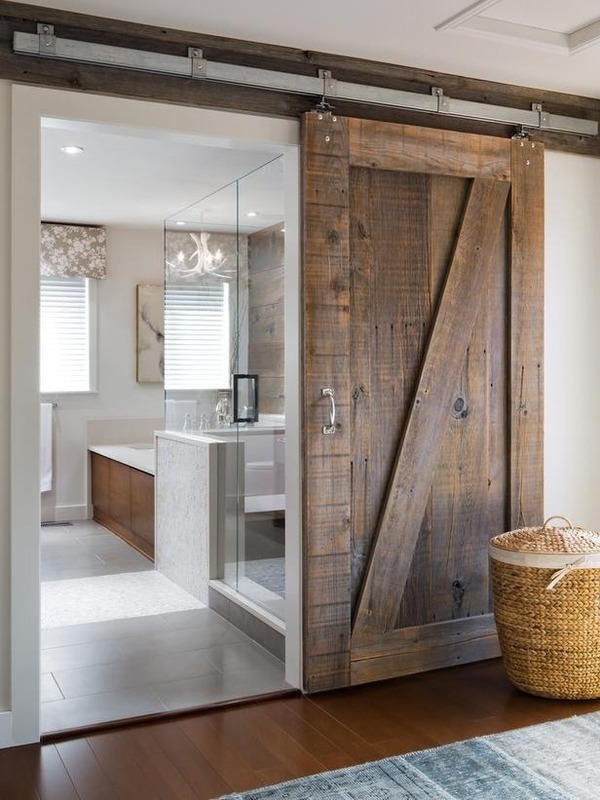 I guess when someone hears the term barn door they visualize either actual sliding doors on a barn large enough to accommodate tractors or farm animals or, if they are current on their design trends, they think of a rustic door in a farmhouse or loft apartment. But obviously, what I should have described to them was a modern/transitional interpretation of a sliding door. Doors that provide practical and beautiful solutions to ill-planned or dated home design. One of the things I’ve always disliked about our “new” home was the awkward french doors leading into the master closets and bathroom area. Not only did they create a lot of noise, the gap in the middle of the doors when closed, never felt very private. 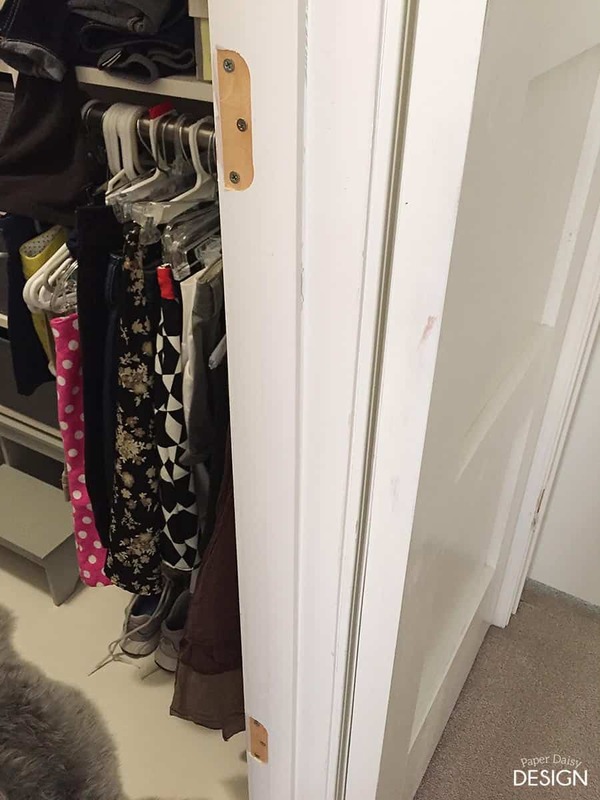 And to make matters worse, just beyond this clumsy opening are our “his and hers” closets, each with doors that used to swing into the closet space. This arrangement greatly reduced the functionality of the available space. The only way to access the items behind the door was to go in and close the door behind you. It really needed something like doors san diego to help make the room a little more secure and private. After many months of living life as a closet slob, because of inadequate storage, and hearing the annoying clang of those doors each morning, I was determined to find a solution. 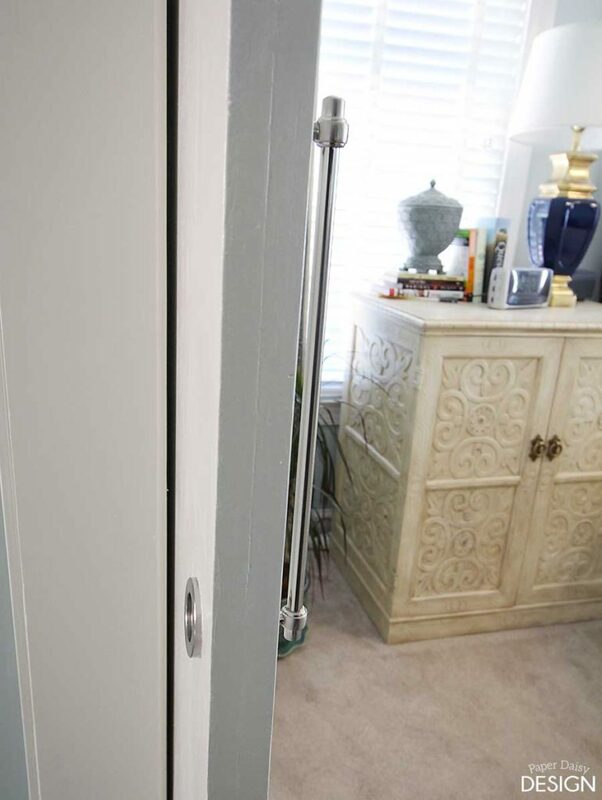 Ideally, the closets should have been built with pocket doors, but to retrofit a pocket door is quite an undertaking. We realized that a barn door or sliding door was our solution. 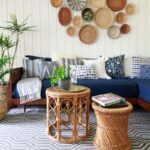 But we also realized that the style of our home is more traditional and a rustic barn door is just not in step with the architecture of the home, nor in keeping with the style of our bedroom. Now, don’t get me wrong. I love a good rustic barn door. I particularly like the more streamlined hardware on this one. And if I were to move to a rustic farmhouse, or beach house or lake house for that matter, I’d be all over a true to form barn door or even one made from reclaimed wood. 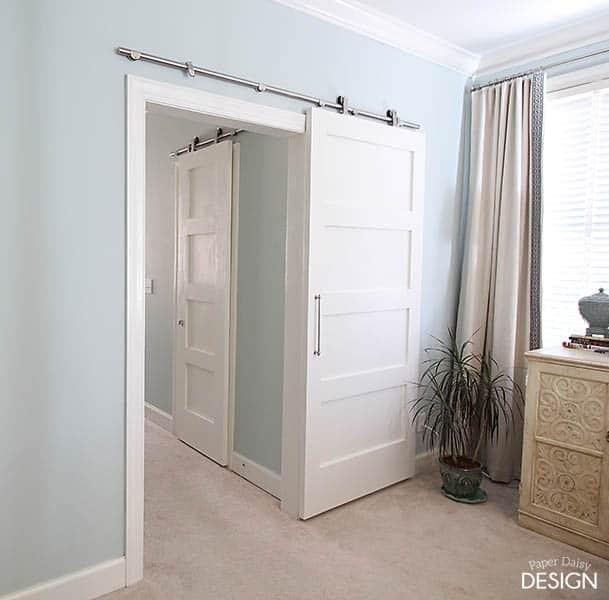 But for our home, we needed a more modern or classic styled sliding barn door. Something more understated. 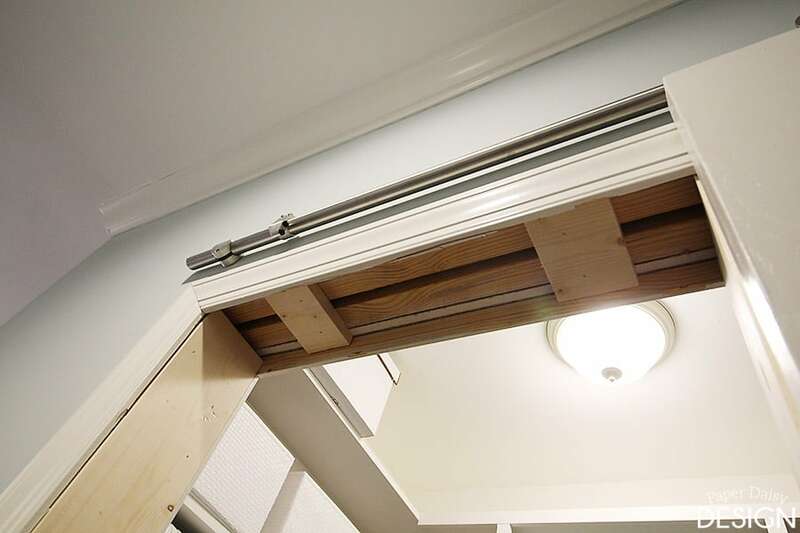 We considered the whole DIY approach to sliding door hardware as well, but I was adamant that the mechanism is completely quiet. We love everything about this hardware. It’s solidly built, completely quiet and very high quality. The only thing it lacked was thorough instructions. If you’ve ever built something from Ikea, that’s what this was like. 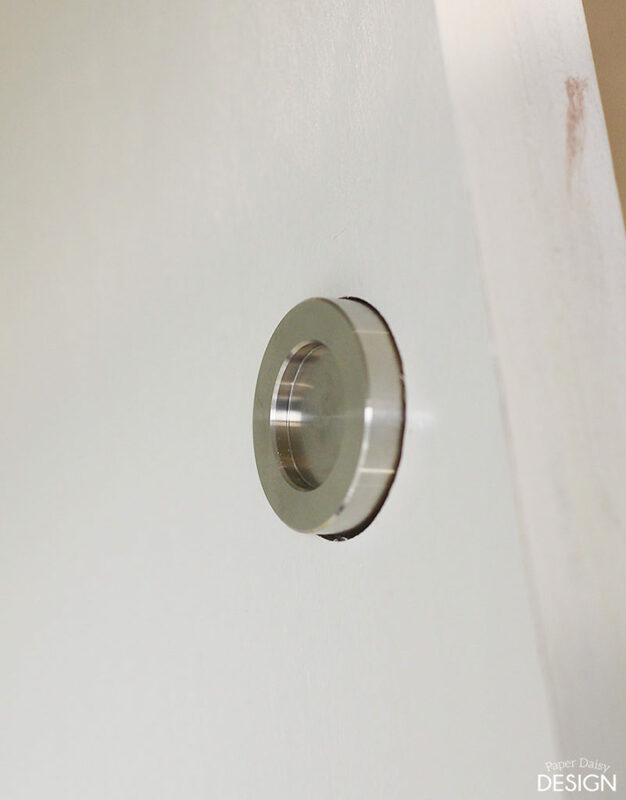 But with a little trial and error, we figured it out here’s a link to the tutorial, tips and things to consider when installing this stainless steel hardware. Our next decision was to choose a style for the sliding barn doors. I wanted something contemporary, yet classic enough to work in a traditional space. A four-panel door seemed to fit the bill nicely. We decided to build the doors ourselves using red oak PureBond Plywood. Click here for the complete building plan and tutorial for the doors. As often is the case, our excitement over what we had built prompted us to haul it upstairs just to see what it would look like in place. We were stoked! After our doors and hardware hung, the next thing to consider was how to deal with the remaining door stop, holes for the door strike and the hinges. 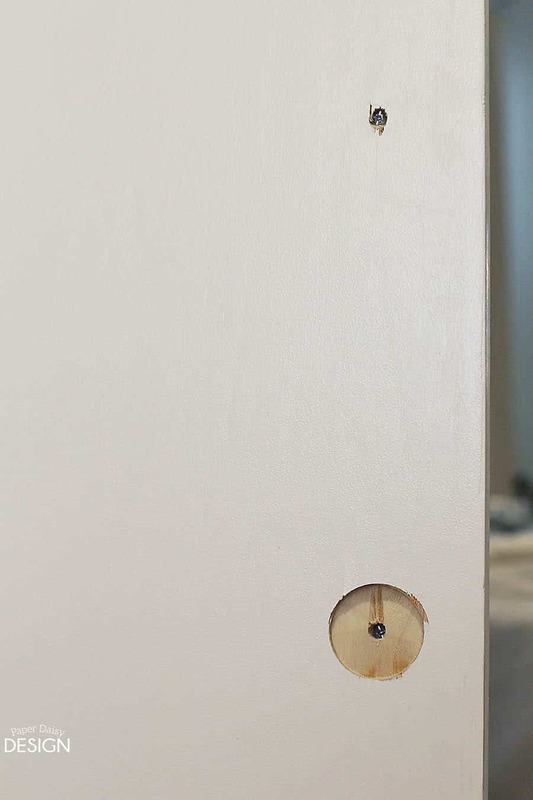 How to update door casing after installing a barn door. One option that would have worked was to cover the offending side of the door jamb with a piece of wooden lattice. It also would have brought the level almost up to the door stop. But we decided to rip all of the casing out and create the look of a cased opening, completely removing the evidence of an old door jamb. This process ended up being a little more involved than we thought. Most homes are built using door kits. 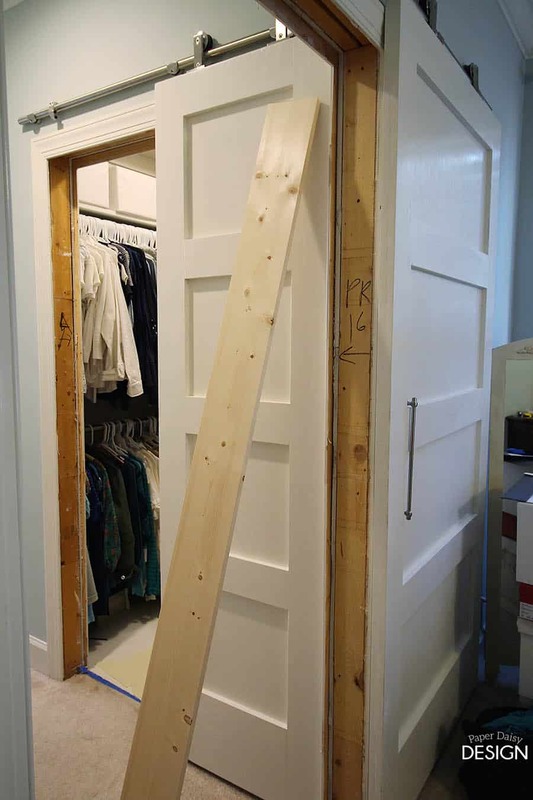 We wrongly assumed that the door jamb was made up of three pieces of wood. But in actuality, it was two pieces that took a good deal of chiseling to remove. It took some careful, methodical work because we chose not to remove the door casing/trim. I left to run an errand, so I don’t have photos of this step, but I can assure you the wood removed looked more like a big pile of long splinters than anything else. To build back the opening as a cased opening we used 1×6’s ripped down to fit the opening, about 4 3/4 inches wide. The level of the opening varied greatly around each side of the door. 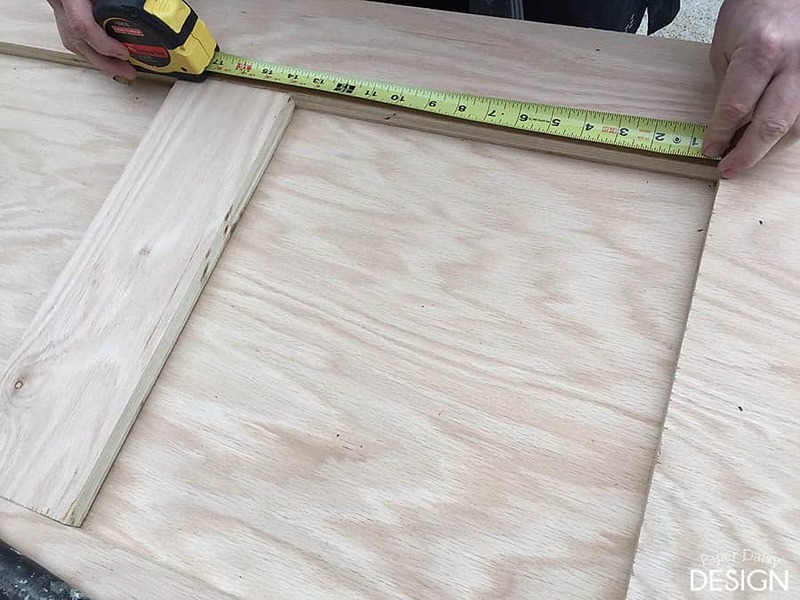 We cut scraps of wood to shim each side to the desired depth. In some places, we used pieces that were an inch thick other places we needed thinner pieces like scraps of beadboard. The resulting transition of a smooth opening was worth the effort. 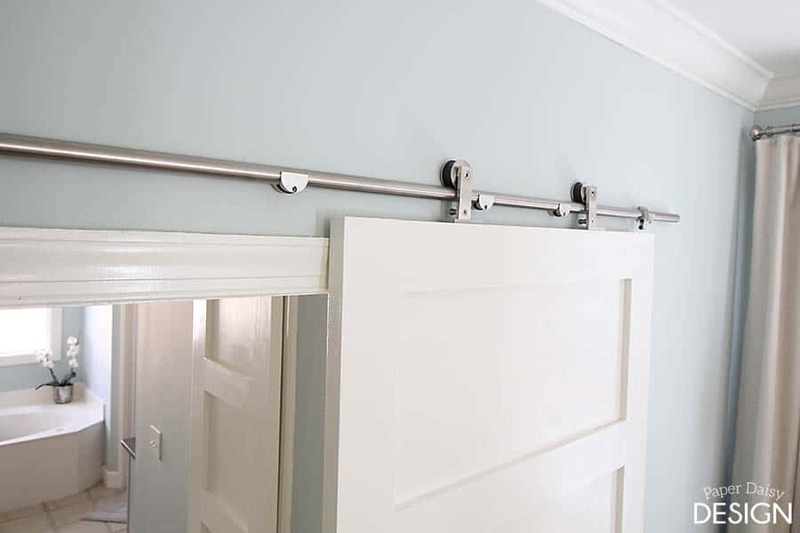 Adding a bar pull to a sliding barn door. When we initially ordered the door hardware we didn’t even realize it came with a finger pull. The back side each of the plates needed to be counter sunk for our doors because of how closely it came to the door casing/trim. This required a little bit of planning. The top hole for the handle was a simple, we just counter sunk the screw into the hole. For the bottom, we counter sunk the finger pull and then drilled a countersunk hole for the handle. Eventually, just gluing the finger pull in place along with caulking around the edges. The resulting space is remarkably clean and open. It’s amazing how removing doors with hinges gives you so much room. It feels so grand to walk through this little hallway now. 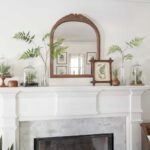 I just love how this has completely transformed this space! 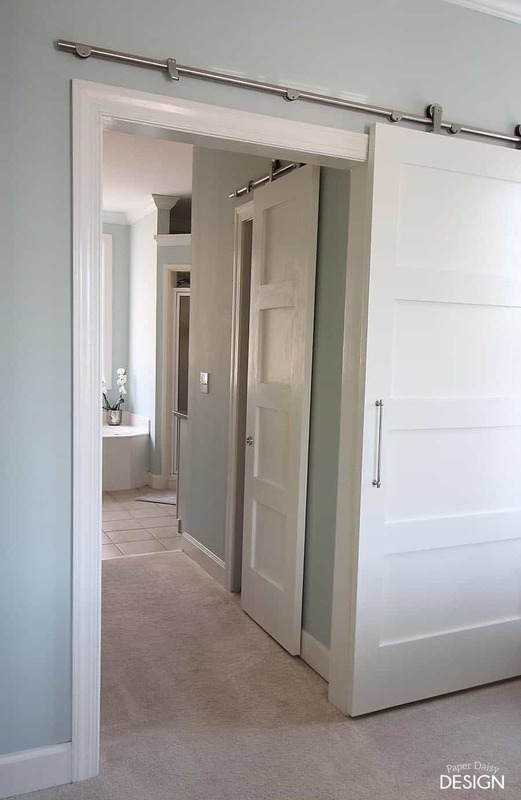 Functionally, the modern sliding barn entry way doors achieved the goal of a quiet, less cumbersome, entry into the ensuite and happily more space in our closets! It also facilitated an amazing makeover to our small closets. You can see the “her closet” here and the “his closet” here. Do you have an awkward door situation? Maybe a sliding door is a viable option for you. I’d love to hear what you think. 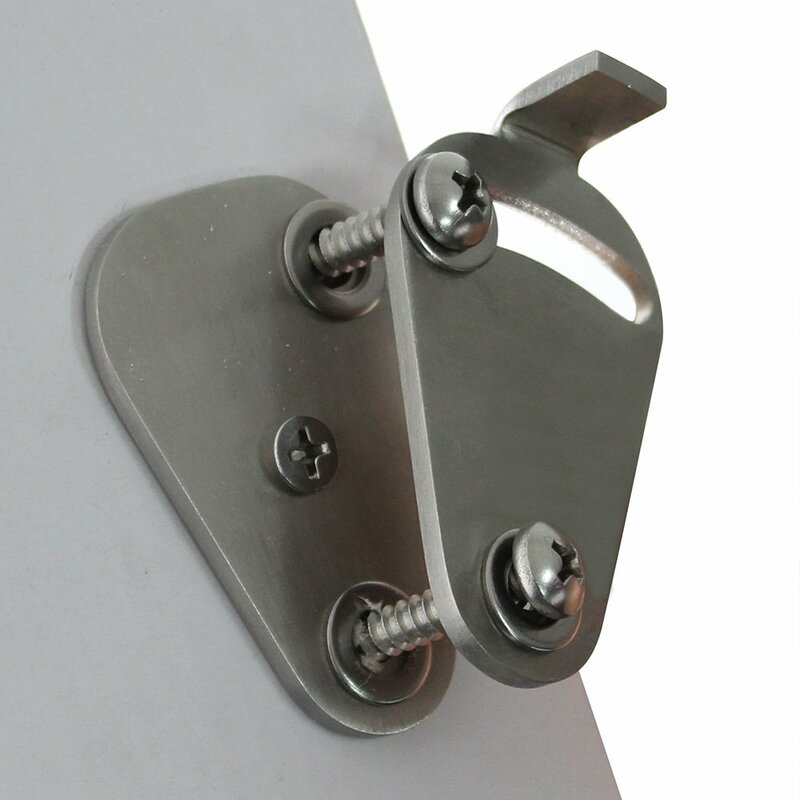 Below are links to Modern Barn Door Hardware and helpful accessories. For full details on the build and plans for the doors, click here. For a complete review, overview, and tips for the installation of the hardware, we used click here. I love this!!! We remodeled a condo and I planned on putting barn doors on our bathroom and closet doors, instead we just sold the place. But next house definitely! aneolitely love the barn door look, especially in white! Wow just beautiful. I have the same exact problem with my master bedroom/bath with the entry into the bathroom and a ridiculously small/awkward entry into my master closet. 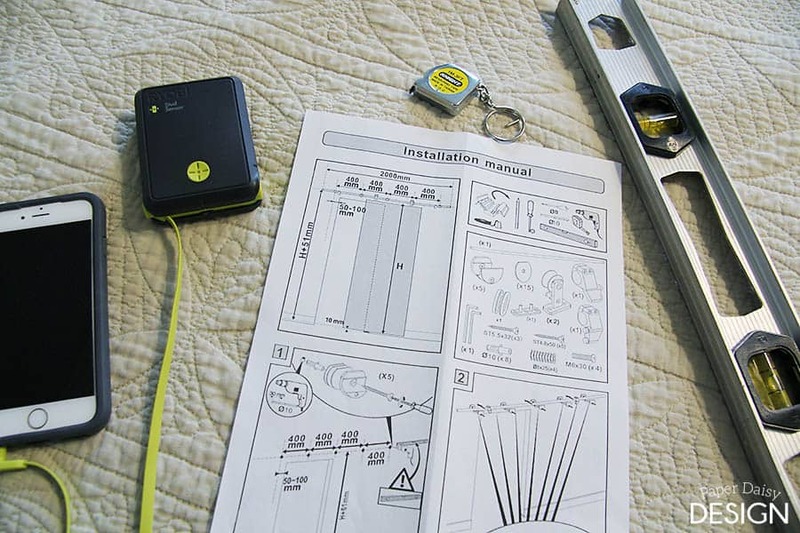 I look forward to your more detailed installation instruction because this is definitely happening in my house! Gorgeous! 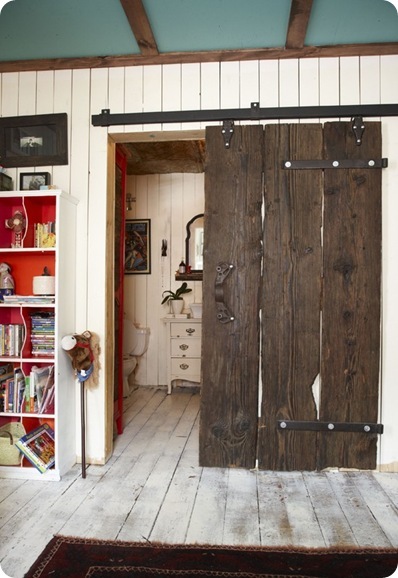 I’ve always loved the barn door look. I hope to someday have a house that it will work with! I love this idea. I wish I could do it at my place. I’m so glad you like it! Because this hardware is top mounted you may find it might work. Here are some of the details. My trim sticks out from the wall a little teeny bit less than 3/4 of an inch. As I answered to Emily, currently the door is rubbing the trim slightly at the bottom because we are waiting for a door guide from another company. The one that came with the hardware is not tall enough because of our carpet. When I get to the hardware tutorial, hopefully tomorrow, I’ll measure the distance of the rail from the wall and give you an exact number. We truly think this is awesome hardware for the money. The quality is impressive. How did this fit over your current door moldings and trim? I thought you had to add wood pieces to it so that the track would be slightly away from the wall? The track system sticks out just enough of that the door slides over the existing trim by about a 1/4 of an inch. That is why we counter sunk the pulls on the backside of the door. Currently, the door is rubbing the door frame slightly. The hardware set comes with a door guide, but we have carpet, so the mechanism provided isn’t tall enough to touch the door. Or I guess we could have made the doors longer. We’ve ordered a different door guide from another company, but it has yet to come in. If you follow me on Facebook, I’ll be sure to update when that comes in. I think the reason the door sticks out enough is because the hardware is top mounting instead of front face mounting. And for the record our trim sticks out from the wall just under 3/4 of an inch. These are really beautiful. And your tutorial makes me feel like a DIY beginner like me could actually do something like this in my home. 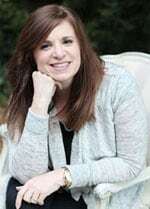 Thanks for sharing the transformation! Nice work. Beautifully done. On an unrelated note, what color is on your walls? This is a great tutorial! I was wondering if you added or had any ideas for how to add an inside lock for a sliding barn door being used for a bathroom? Hilary, We actually don’t have much of a need for a lock ourselves. Only one teenager left here at home and she wouldn’t dream of opening the door. lol If it was an issue, I probably would have left off the back hand grab and switched it out for a sliding lock. Then you could use the little handle on the lock to slide the door back open. Hope this helps! I LOVE this idea. we are buying a new house and hated the way the door almost hits the toilet when opening it! I think I have talked my husband into doing this! I’m so glad. I can’t begin to tell you how much this change has improved the space. I know you will love it and I honestly believe that hardware is the best money can buy, especially for the price. Oh, and send me a pic if you do. I loved the create a collage of all the barn doors this has inspired! 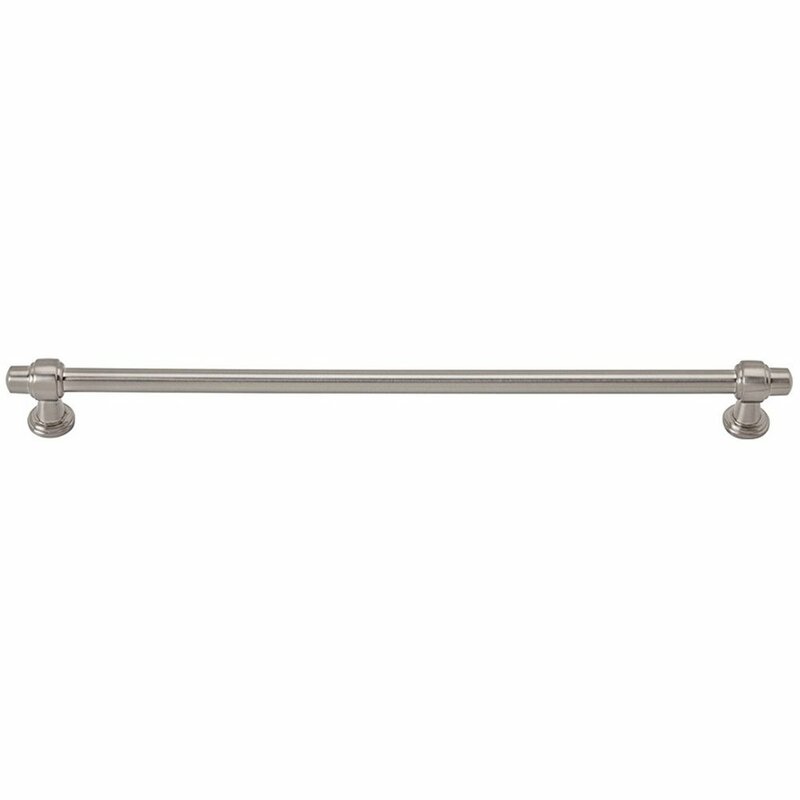 I am putting a ‘barn’ style door into our master bath (we are doing new construction) however I’m having such a hard time with the handles.. I think by looking at your handy dandy work, you may have solved my problem.. With the beautiful pull on the exterior, how did you hide the countersunk screw at the top? putty and paint? It is genius to hide the bottom one with the counter sunk insert!!! 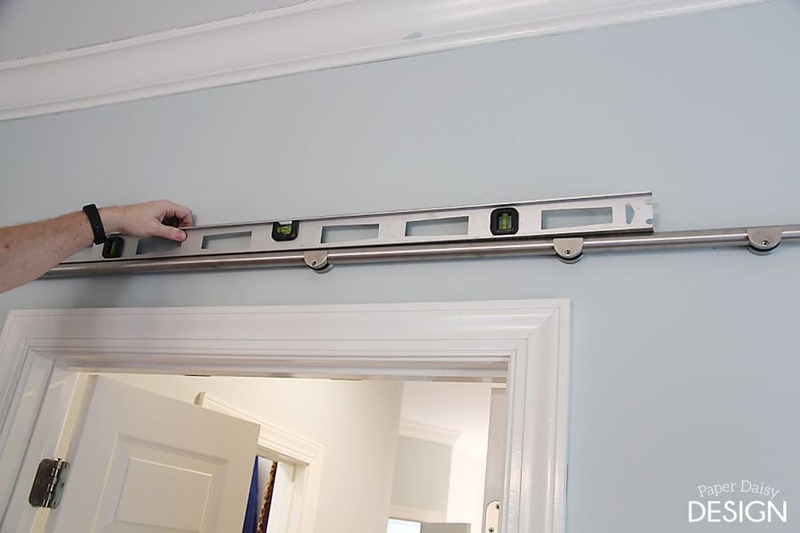 totally going to do this as I am pretty sure the sliding hardware I’ve ordered doesn’t come with the pull hardware!! Yes, I just used putty and paint to hide the top countersunk hole from the door pull handle on the other side. Just be careful gluing the countersunk finger pull. I used Gorilla Glue and it didn’t dry completely level. I’d use something else if I were to do it over. it comes with the finger pulls and everything. Just not the larger cabinet pull. I added that. I love this and we are ordering the hardware today! The link for the statement pull is broken. What is the length? Where did you purchase it? Thanks! Jessica, The color on the wall in both our bathroom and master bedroom is Rainwashed by Sherwin Williams. We love, love, love this color for both rooms so calm and relaxing. Congrats on your new home! So exciting! Your doors are awesome! And I love the wall color. I’m hoping to put a sliding door in a bathroom. I’m curious to know if there are any gaps that would affect privacy? I am hoping to do this on our laundry room; the door opening into the room really gets in the way. There is a half bath in that room also, so I have the same concern as Finley, your last commenter… are there gaps that affect privacy? I’m not thinking so much around the perimeter of the door, as you obviously build it wide enough to cover, but rather the space between the door and wall. Could my curious toddler peek behind the door or guests see inside as they walk past in the hallway? Also, I read your reply to the other comment about adding a lock, but I don’t know what you mean by a sliding lock. Could you give more specifics, maybe even a picture of the sort you think would work? Thanks for a great tutorial & link to the hardware! The way the hardware allows just enough room between my door frame and the door, you really can’t see in at all. It close enough that it almost touches the frame, but doesn’t so that’s pretty snug. And like you mentioned, I would build or buy your door big enough to cover the door frame completely. I’m trying to set up the link but it’s not working. I’ll come back and edit as soon as I can. 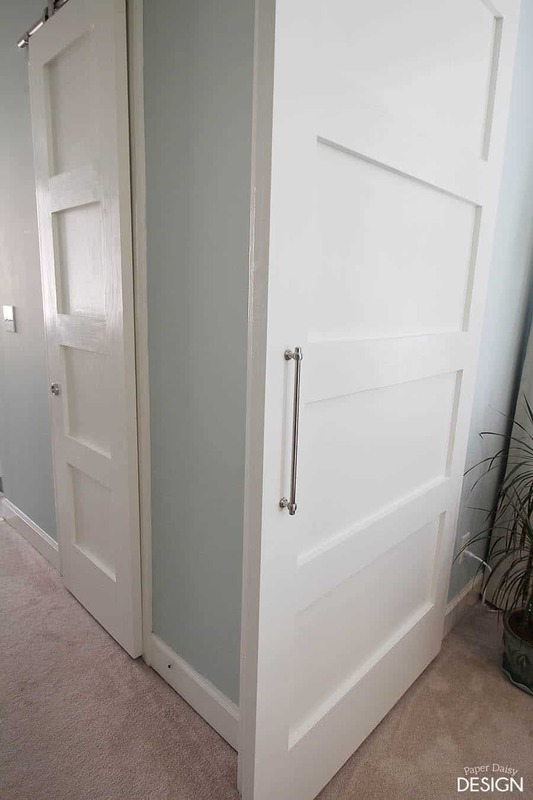 Thanks for posting the details of putting this modern barn door online as I’ve been wanting a door between the master bath/bedroom for 12 years! I just picked up a Panel door off Craigslist for cheap and ordered the track. I can’t wait to get this installed this weekend. I did have a question — where did you order your “statement pull handle” ? I really like it and it would work well for our door as well. If you can send or post a link, I would greatly appreciate it. Thanks again for posting this! Did you use the same 4 panel design on the back of the door or just the front with the back being a plain sheet of plywood? I just left the back flat. If we added trim to the back of the door, then we would have had to remove the door casing. It would not fit behind the door. That is the beauty of the particular hardware we used. The brackets are mounted to the top of the door. I don’t mind the back being flat. No one sees it and it painted up very nicely. We recently redid a little house and the closet in the master bedroom has the 2 doors that slide back and forth over each other. My daughter hates them and has left them off because they are so cumbersome. Problem it isn’t pretty looking in the closet all the time. I’m not sure of the actual width of opening, but it seems like this is the solution to the problem. There is enough space to slide the door. Great idea and can’t wait to check out this hardware. your barn door vs. convential door. How much sound insulation do you sacrifice with this door? since the barn door is not closing into a jamb i can’t imagine the sound insulation is as effective. Ed, Surprisingly enough it makes for a MUCH more quiet environment than the bifold doors we had. So it’s definitely not a sacrifice. The heavy PureBond plywood really blocks the noise and the door does go just past the frame of the door, so essentially it’s actually blocking more sound because the crack opening is beyond where the sound is coming from. I am extremely happy sleeper now when my husband gets up before I do. Looks great… But does the door rub against the trim and scratch the paint ? 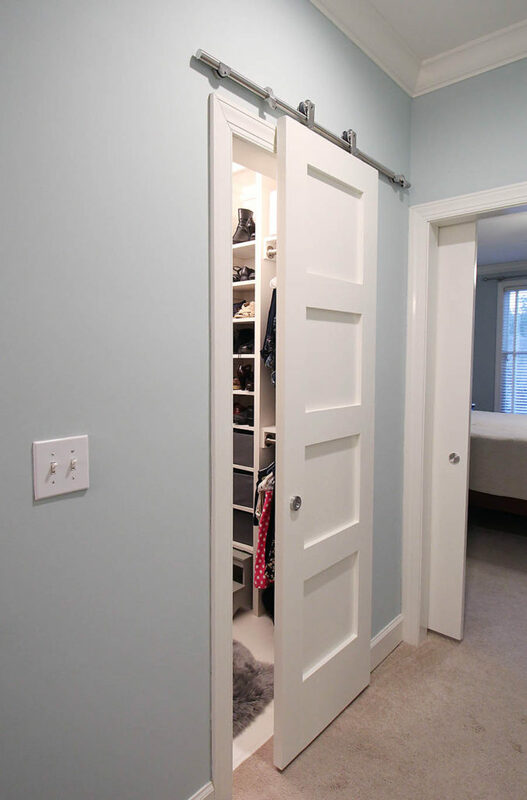 I want to do this in a hallway to close off the entrance to our basement but I was thinking I would have to remove the trim so the door wouldn’t scrape it ? 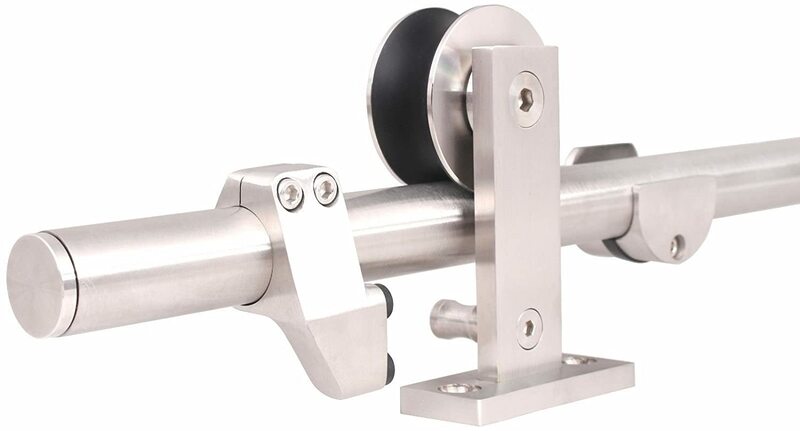 That’s the beauty of this particular mounting hardware. Because the hardware is top mounting instead of front door mounted, you gain room for the door to slide. 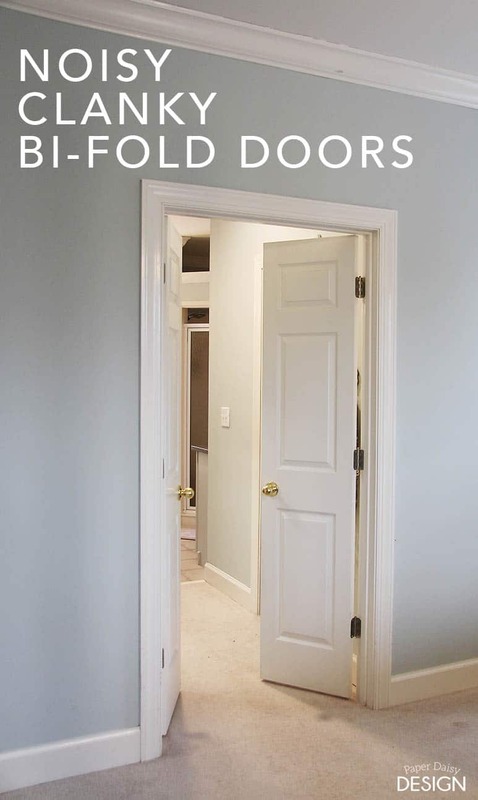 Of course I can’t guarantee your molding will not touch a door, but if you read this post and the related posts carefully, I outline how deep the door is and the measurement of the depth of my door casing and you can compare that to yours. We love ours for many reasons, but the ability to keep the molding was a huge plus! I LOVE the sliding barn door idea for our home that we are currently building. My husband and I would love to have one for our master bedroom but we are concerned with privacy. How large are the gaps between the door and the wall? Can you see into the room through them? 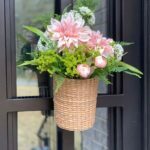 So glad you like them and want to use this idea in your home. I know you will love the look! To answer your question about privacy. No one can see into the room if you build your door to cover the door frame. Because the door is very solid, the noise is buffered very well too. However, as many people have commented, it is more an issue about being able to lock the door. We use ours as the bathroom door and closets which are perfect. Our children are teenagers and are not going to open the door. I have suggested locks in other comments so look back through them for suggestions on that. If we were concerned about someone coming in, we would just lock the bedroom door. After market pocket doors lol. I like the barn door look much better for sure. Thanks Lauren! Our hallway is a decent sized, 42 inches. We do keep the doors open most of the time, but either way it never feels crapmed. It actually feels more open. I’m not sure how, but I guess it’s the archetctural insterest they provide. I’d guess the doors as they are hung only add close to 2″ not including the large pull that is on the main door. 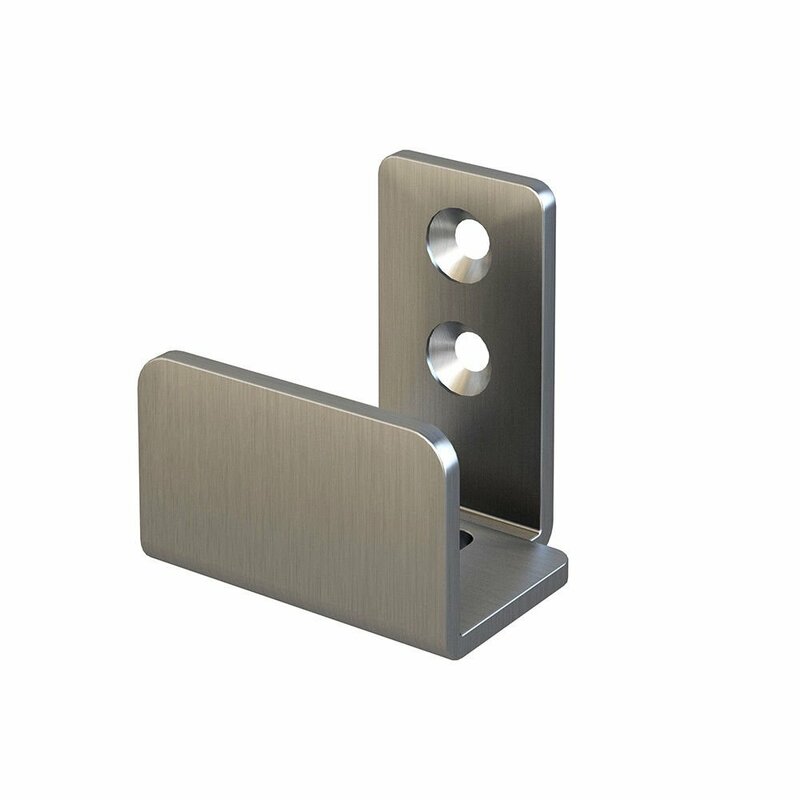 We used the finger pulls that came with the hardware on the closet doors. Hope this helps. I’m sure you would love them. If your situation is anything like mine was, any improvement was extremely welcome. Was wondering what tool you used to counter sink the finger pull and how you did it. We used a Forstner bit to drill the hole for the finger pull. It was just a smidgen larger in diameter than the pull. To counter sink the screw for the handle, we found a bit that was a little bit bigger than the head of the screw and drilled a hole for it to go into. Pay close attention that this larger hole does not come all the way through the door. Hope this helps. Thank you! I think this is the solution we are looking for. The annoyingly loud pop from the bathroom ball and catch doors is driving me insane. Much too loud first thing in the morning while spouse is sleeping. Jennifer, I feel your pain! That is exactly what we dealt with. I am not at all a morning person and it drove me crazy. It’s so very much better now. 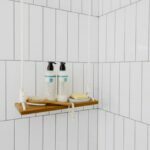 You will love the look and the function it adds to your space! Good luck and let me see your finished project! thank you for starting this up. This web site is one thing that’s needed on the internet, someone with some originality! It’s hard to find knowledgeable people about this subject, but you sound like you know what you’re talking about! I don’t understand, did you actually only spend $50? They cost that is showing up on the pin is (as far as I can work out after clicking the myriad of links necessary to view the full tutorials) only for the wood to make the actual door panel. 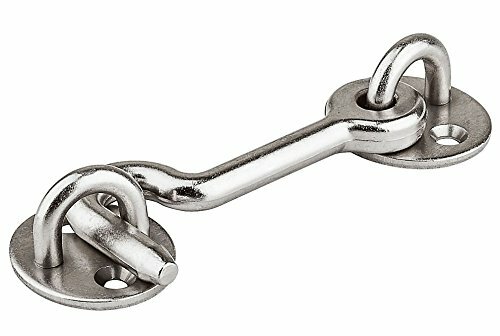 The hardware to hang it is around $90 on Amazon right now. And I’m guessing there were some other expenses as well. I specifically say it is to build the door. I will say that in comparison to many barn door projects this is still a very reasonable budget especially for a large door. I was able to build all my doors and buy the hardware for the price of many sliding door hardware units I found online. That’s fantastic! I am collecting photos of reader’s doors if you would send it to me I’ll eventually be sharing them and would love to include yours and see how your trim looks!! I’m thrilled the tutorial was helpful and provided a solution to your room and door situation. The casing was a bit nerve wracking as we were trying to keep the trim! But it worked out fin and it sounds like your solution is great too! Hope you continue to join me on my DIY adventures. Here’s a place you can subscribe to my email newsletter and never miss a post! There’s some good stuff coming!! Wink, wink! Our bathroom entry is 24″ wide. Should I make the barn door a little wider than the opening ? Should the door be wider than the opening? If so how much. Is the inside of the door flush or is it “paneled” as well? The door is flush on the back side. It does have a nice woodgrain from the high quality plywood. You could add paneling, but that would likely make the door not fit over the existing door frame/molding. This is a great idea to cover my closet opening that is now naked. Thanks for making the instructions seem doable for a beginner like me. Also giving specifics for hardware. That’s the best. 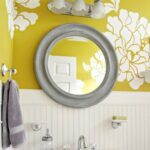 We are wanting to do this for our daughter’s bathroom but curious about the bottom of the door. Does there not need to be a track for the bottom of the door? Does it flap back & forth any? Seems like it would move along the bottom if not on a track as well. Yes, The kit actually comes with a glide that is supposed to be added to the bottom of the door. I would recommend doing that for a room a child would use. Do you have a photo of the bedroom door shut? Does the barnyard door cover the molding or can you see the molding on the outside? Trying to figure out if I need a larger door. I do not and I just moved. I would strongly suggest making the door wider or as wide as the door casing so that you don’t see the molding once it is closed. It also gives you more complete privacy if the door is larger than the casing. The door we built was larger than the doors we took out. This looks great, but I was really disappointed with the falsely advertised title. Nothing about this project added up to $50 – the hardware itself costs almost $70! The post about the doors clearly says you can build doors for $50. Sorry you found that misleading. The stand by the statement that price of the hardware is extremely reasonable. 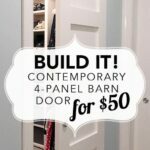 If you price barn door hardware, it is not uncommon to find them costing $400-500 so I feel like this is a budget friendly option. Not only is the hardware inexpensive, it is extremely well made. A great job done. I am so with you on needing something contemporary and modern to fit in with my house style. I now need to figure out where I can use this! Leslie, great tutorial. I just got a price for someone else to build a door at $350. With your great instructions and yes knowing that Home Depot will cut the wood, I know I can do this project. I have 3 questions for you. I have a tight a space. The actual old door is 30 inches wide,1. would it be good to add 1 extra inch, so I have about 1/2 inch overlap (it is for a closet, so don’t need any privacy), or is 30 inches ok? 2. I have the same kind of door trim as you, with wood floors. Will I have any issues with the door “scraping” the trim? If so how would I solve this issue? 3. Is there a simple formula for figuring about the lengths of the “frame” and “cross” pieces? I see Leslie hasn’t answered you yet, so I hope you don’t mind another reader answering your question. You want an extra inch or two on each side of the door. If you bump into it and it is the same size as the opening it could swing into your opening and damage both your closet opening and the door. If you can only do an extra inch total, do that. You don’t want it to be exact. We were wondering how many inches did you add to the top of the door. We are just getting ready to make our door. We did buy the hardware you did and love it. We have hardwood floors and door will be the entrance to the bathroom. Thank you! I love this! 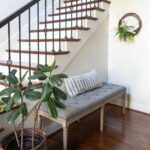 My husband and I are buying a house, and I want to put a door between the dining room and living room in case we ever want to keep our pets out of the living room. However, we want the space to be open most of the time. 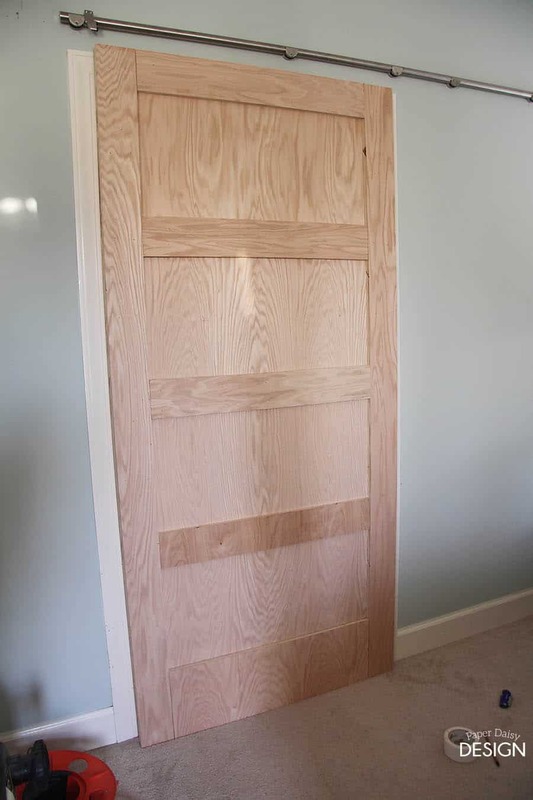 I thought a barn door would be the perfect solution, but my husband and son are against something they perceive as country and rustic, but this modern style barn door would look great and would appeal to my family as well. Thanks for the great idea! I’m so glad this was a solution for you! I felt the same way about the door not looking like a barn in this space. The hardware is very nice and I’d highly recommend it. Love what you did here. I’ve already ordered the hardware but I’m curious why you used 3/4″ plywood? I was planning to do two panel….on both sides. If I use 1/2″ I’m thinking I can do a triple layer with the 2 panel look on both sides and reduce the thickness & weight. Any specific reason you chose to go 3/4″? I think we were concerned withusing the 1/2 plywood that it might eventually bow. But mathematically it works out. I just can’t say for sure the strength of it since we didn’t do that. I would recommend finding PureBond as that is the best made product available. Please feel free to update me with your results. And know that I can’t promise how it will perform since it’s not what we did. I recently built another door out of cypress boards and so far it’s doing well. I’ll be adding a tutorial in the next month, adding more details about different hardware options, locks and such. Hope you will follow along. Good luck with your door. If you other questions please feel free to send them along. Makes sense! I’m hoping if I wood glue all pieces to the main sheet I can give it that added rigidity to prevent warping. I’ll update this once I get it done. Can’t wait to finally have a master bathroom door. Hi Leslie…Almost have my door ready to hang…so excited, it turned out beautifully. One question I had, since I too am keeping my casings around the opening, did you mount the rollers at the top flush with the back, flush with the front, or centered on the thickness of the door. I was thinking maybe flush with the back to give that added clearance of the trim but your advice on what you did would be appreciated. Thanks! Happy to help. If you purchased the kit that we used that hardware wheels are meant to be top mounted.We mounted them in the center for stability. Check out this post for photos of what I’m referring to. I recently built a new door (post to come soon) and I used more of a rustic/traditional front mounted hardware. We had to add a board to mount the bar to do that we could clear casing. That’s the only way it would work. So I’m not sure if this really answers your question. But I hope it does. Hey girl- nice job! Do I need to warn our kids to be careful about pinching their fingers when sliding the door from the inside? There is a bit of a gap on the sides so I don’t think it would do too much harm. If the door overlaps the molding like you would want for privacy there is less of a chance for pinching hazard but honestly, I didn’t have small ones to worry about. Sorry. Do U are can U make a double morden Barn Door that would total 84″ when closed? If so how much would U change for this W/Hardware $ Thanks for U’re help! I am glad that now there are more colors in the barn doors other than rustic wood colors we have seen all those years. Love your ideas though, I wish barn doors could have some glass panels as well just like French versions have.